Pour me a porter, bring on the beer, I’m in need of an IPA! What beer puns or alliterations do you have up your sleeve? Because now’s the time to show them off! Why? 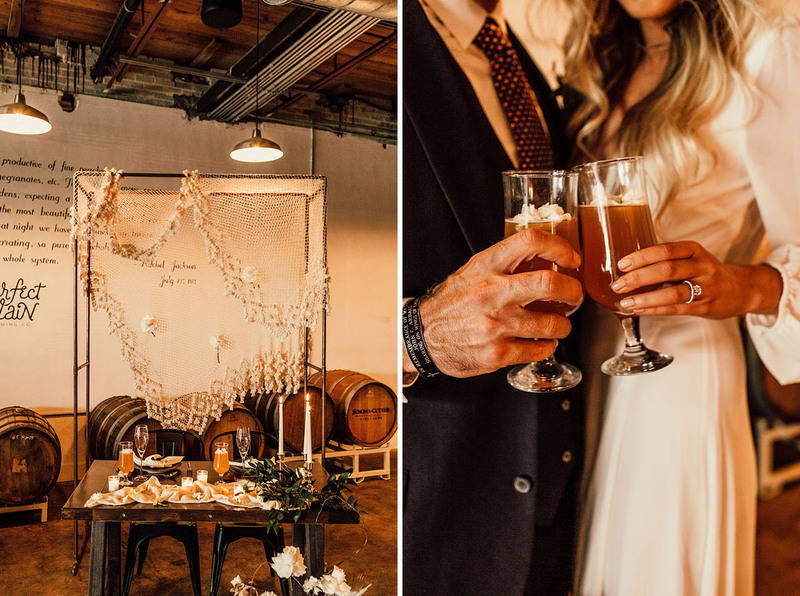 Today’s boho wedding inspiration is coming to us from Pensacola, Florida — at the newly-opened Perfect Plain Brewing Co.! 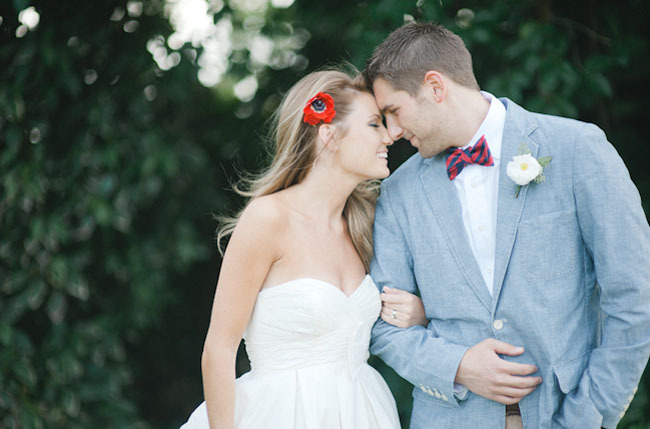 Pensacola is known for its white sand beaches and tons of historical, exposed brick reception venues. 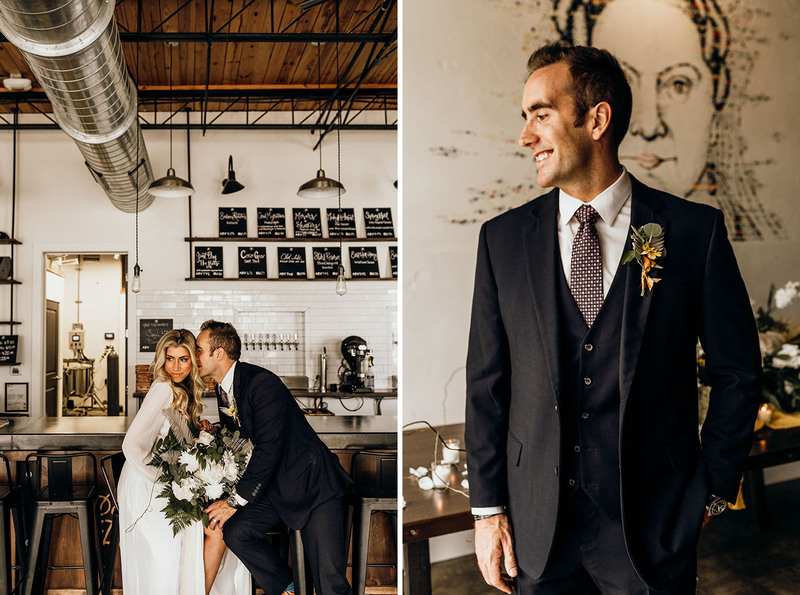 Wanting to create something unique for the modern bride, Love, Anneliese Photography went for something a bit unexpected: the brewery, located in the heart of downtown Pensacola, concrete floors and all! 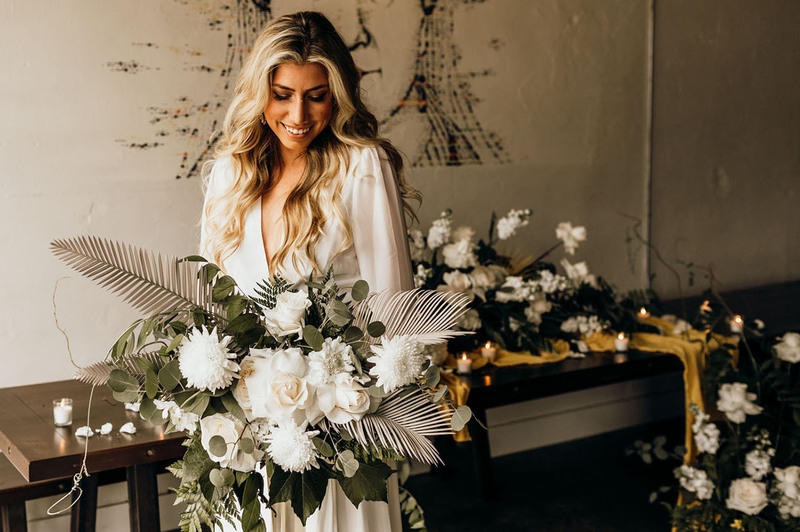 She shares: I adored the open air feeling and wanted to bring an urban vibe, along with bohemian stylings for this shoot. 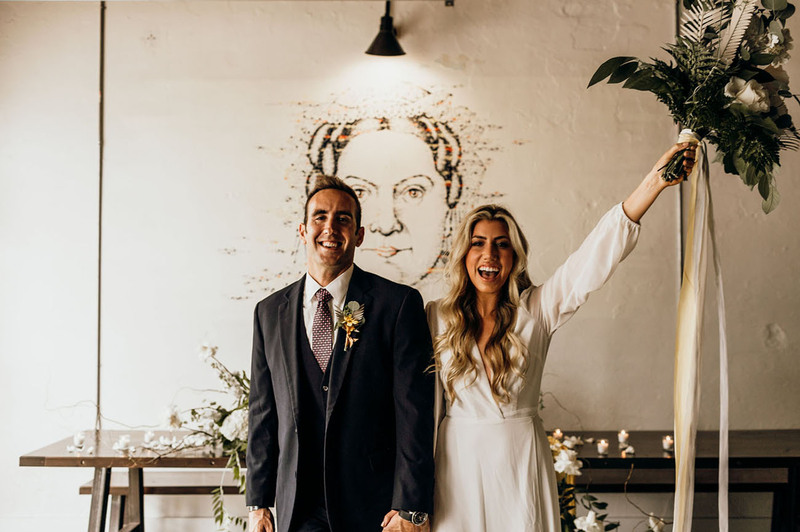 And what better place to have a ceremony than at a brewery? 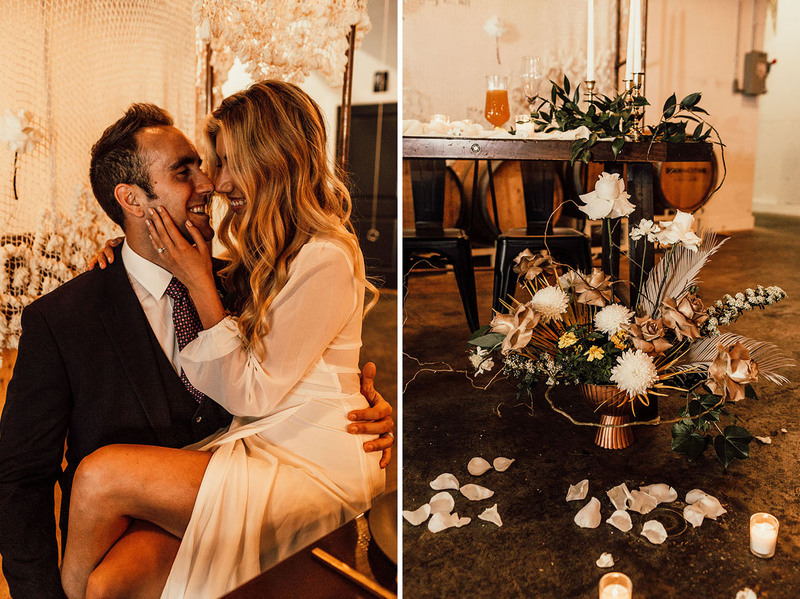 You’ve got a built-in reception venue that guests will love! Look at those gorgeous blooms! 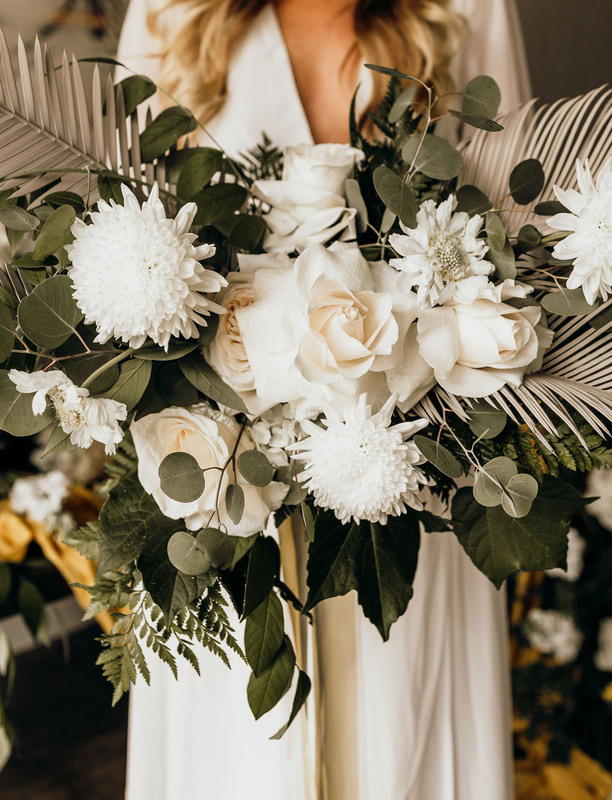 Supposey Co. paired palm fronds with silver dollar eucalyptus, and brilliant white posies. VA-VA-VOOM! 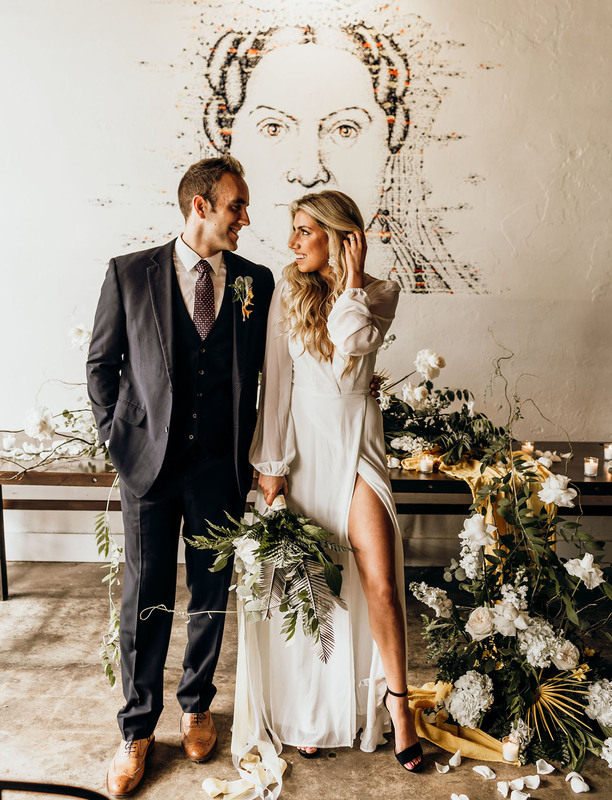 Those sheer sleeves and a whole lotta leg! Isn’t this gown from Tobi absolutely divine? 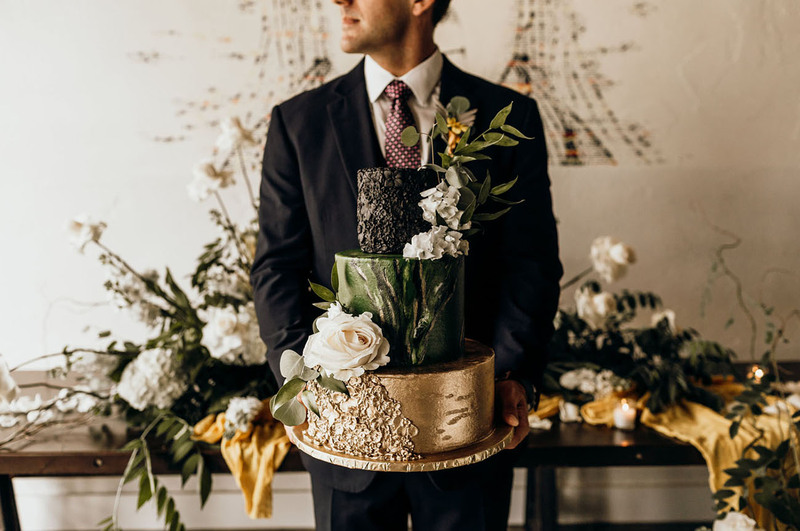 Keeping the ceremony space simple + sweet, Supposey Co. created a makeshift altar with tons of greenery, a sweeping golden table runner, and a collection of candles. 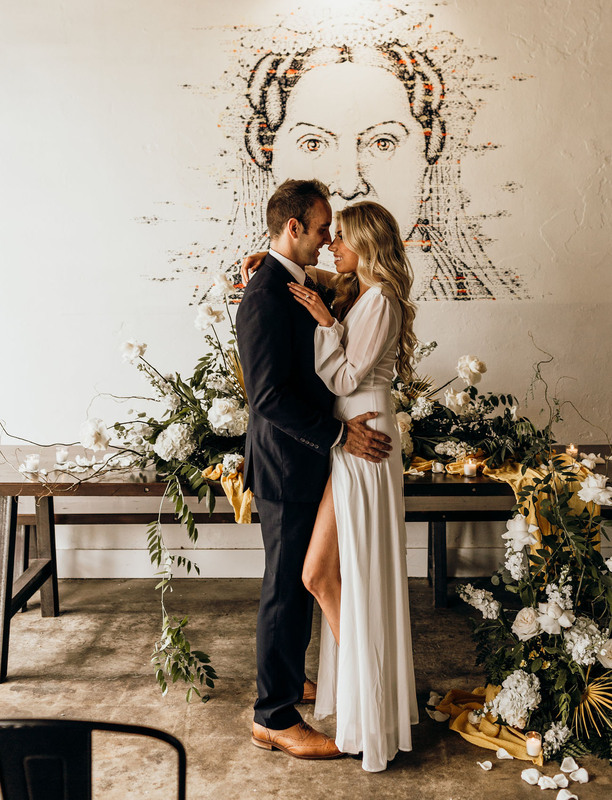 Anneliese shares: The waterfall floral ceremony arch was designed to highlight the mural of Rachel Jackson — who wrote in a letter back in the early 1800s that Pensacola was a Perfect Plain… which is where this brewery gets its name! The yellow accents are subtle, but create a nice *POP,* don’t you think? The color palette was inspired by the local brews: warm ambers, vibrant marigolds, and edgy copper accents. 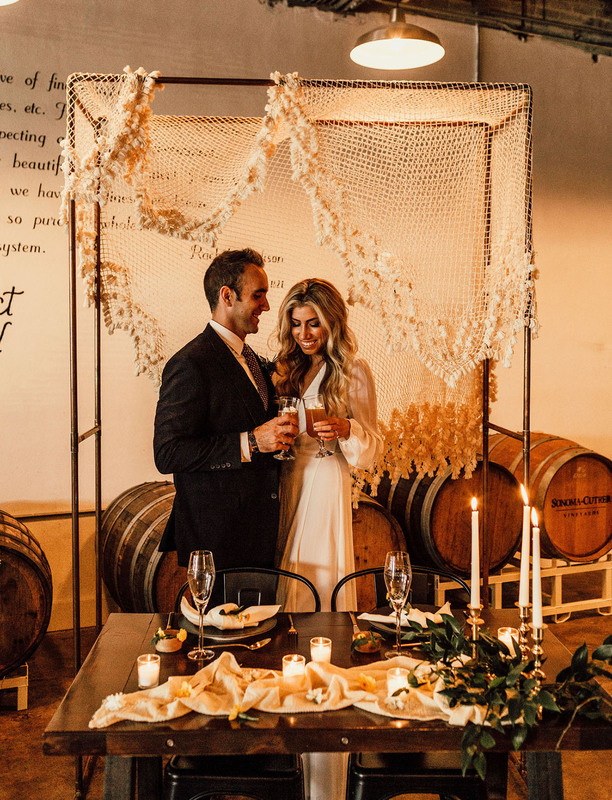 To add to the sweetheart table vignette, the team installed a copper arch with a vintage woven throw. 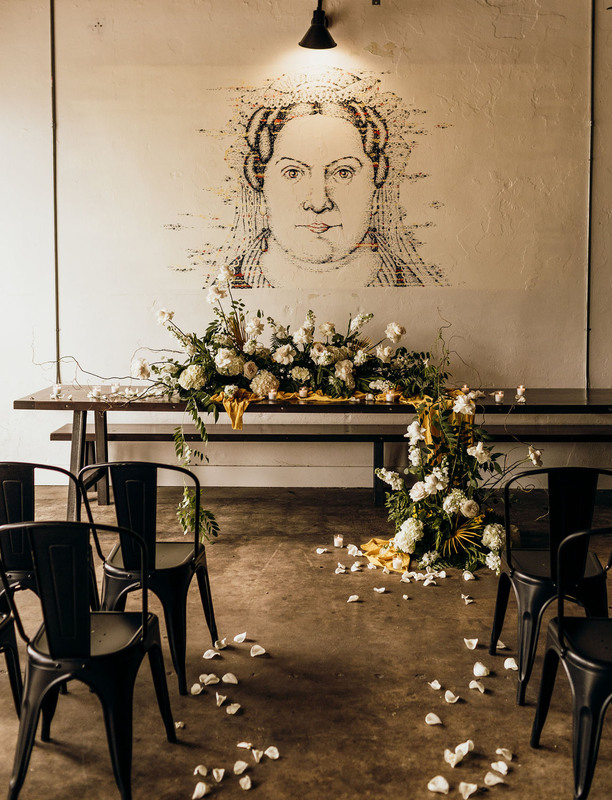 Black and gold accents were mixed in to elevate the space, while still keeping it grounded in the industrial roots. What a setup! (Those are actually garage doors, believe it or not.) 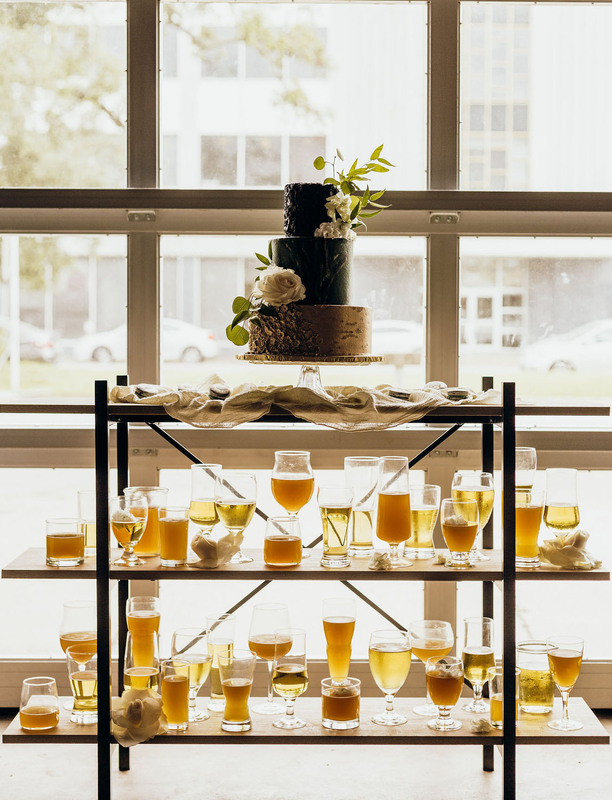 Using an industrial-looking shelf (courtesy of Walmart), the team filled 60 vintage glasses with different brews to frame the marbled buttercream cake from Bonne Vie Specialty Foods. Cheers to that! 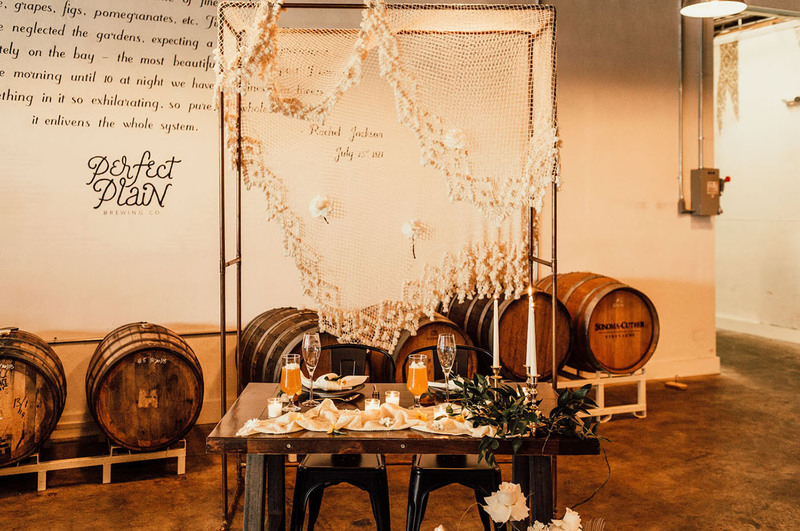 You can truly make any space into a venue, with a little creativity and ingenuity. Are you early in the planning process? Perhaps explore your downtown area or opt for an old warehouse! 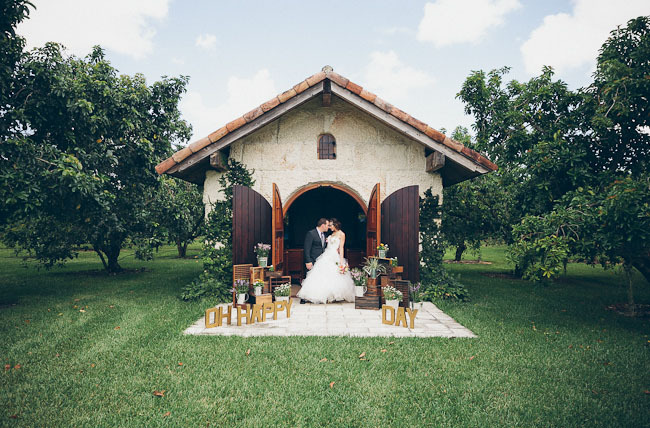 Such a great idea to use this spot as a wedding venue!! LOVE the creativity here from all the vendor collaboration. In this scenario people are exciting to do work with their appreciation. Thanks for sharing such a great idea.